Before you start, generously butter the insides of 3 ramekins. Carefully separate your eggs - you don't want any yolk contaminating your whites. Preheat your oven to 220°C (428°F) for a fan/convection oven, or 230°C (446°F) for a conventional one. Put a roasting tin on the middle shelf, and almost fill it with boiling water - you need to leave enough space for displacement when the ramekins go in. Melt the butter in a small saucepan over medium heat. Add the flour and blend into the butter. Add the milk, stir well, and cook for a few minutes until the sauce thickens. Add the mustard and the cheese, stir well until it's all melted, remove pan from heat. Stir in the egg yolks, one at a time. Set aside. Using an electric whisk or stand mixer, beat the egg whites to stiff peaks. Add a pinch of salt about halfway through. Gently fold the stiff egg whites into the sauce base - you want to keep as much air as possible in them. Spoon the mixture into the ramekins. Leave a space of about 1cm (just under half an inch) at the top. Place in the bain marie and bake for 10-15 minutes. Get your soufflés on the table as quickly as you can - I always serve them in the ramekin they were baked in. Enjoy the taste of luxury! The video above is from the Keef Cooks YouTube channel. 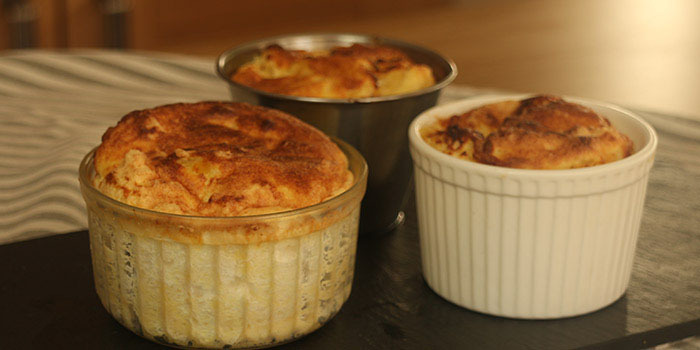 Click here to see the video recipe of Cheese Soufflé on YouTube. Use any hard, melty cheese you like - gruyére is common, but I use mature cheddar.